The Circuit de Spa-Francorchamps and Autodromo Nazionale Monza provide F1 teams with a unique challenge, in that there must be a severe compromise between top speed and cornering performance. As such, much of the allocated practice time is spent finding the optimal wing levels to run both front and rear, not only for the best laptime, but also to allow overtaking during the race. Such is the focus on reducing drag, and maintaining as much downforce as possible at the same time, that new parts aimed at general car performance improvements are less prominent, although some teams did bring these further upgrades as well. While Ferrari’s performance at Spa was surprisingly good, as was expected, it was unable to challenge Mercedes at Monza, with the circuit placing greater emphasis on power unit performance and straightline speed. However, the team’s lack of pace, especially relative to Red Bull, will be of concern, and a detailed investigation, not unlike the one conducted by Mercedes after Monaco, will surely follow. Regarding the aerodynamic set-up of the SF70H at Monza, there were no major changes to the front wing, while a new rear wing was used throughout the weekend, with a much lower angle of attack than any other used so far in 2017. Perhaps surprisingly, it did not feature the spoon-shaped philosophy that has been used by Ferrari so effectively on its medium downforce rear wings at Canada, Baku, Silverstone and Spa. The aerodynamic efficiency benefits of this wing style are well documented, and considering this is one of the few key areas where Ferrari is lacking compared to Mercedes, it would have been suspected that, like the champions, the philosophy would be retained. Together with the lower AoA mainplane/flap configuration, the endplate was revised, featuring four closed louvres, in a similar style to the version run earlier in the season. 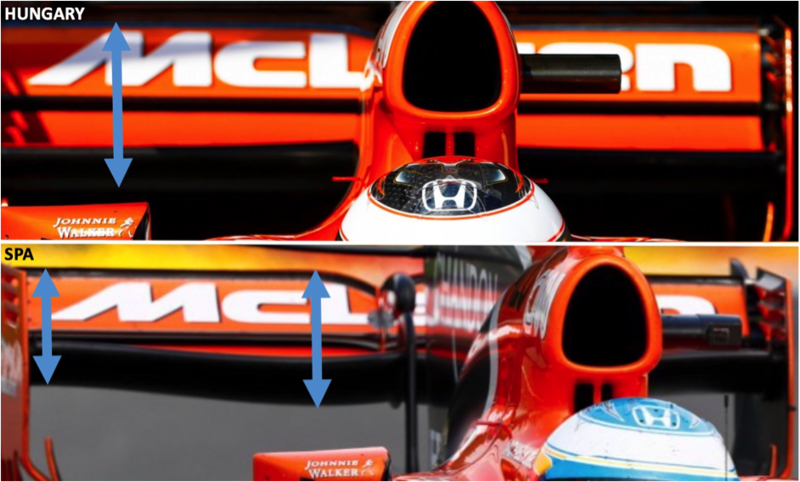 This change was made because the pressure differential either side of the endplate no longer needs as significant attention as previously, given the lower angle of attack orientation. Williams enjoyed a much more competitive weekend in Italy than at the previous four races, with the track suiting its Mercedes power unit and the team seemingly able to achieve a better balance, which was clear from its improved performance in the wet qualifying session. For the first time this season, the team brought revised rear wings to a race weekend, in addition to the launch-spec one which has been used thus far at all other circuits. The v1 Monza design (not pictured here) simply featured a lower angle of attack across the wing’s width compared to the edition used at Spa a week earlier for less drag and greater top speed. In Free Practice, this was used together with the closed four-louvred endplates with which the team started the season, before a return to the open-louvred design, introduced in Hungary, for competitive sessions. However, this was probably more to do with spare parts than any potential performance advantage. This mainplane/flap version was chosen for the race by both drivers, something that was not correctly documented in other publications. 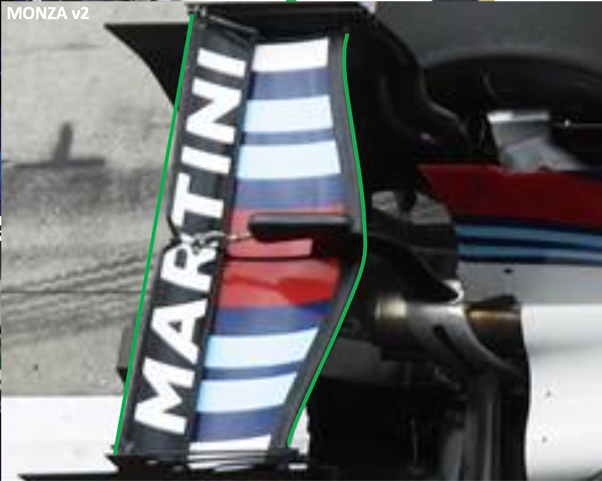 The v2 design is more complex to understand, given its V-shaped flap (see line below for comparison to straight flap), something that has not been seen in F1 in recent times. 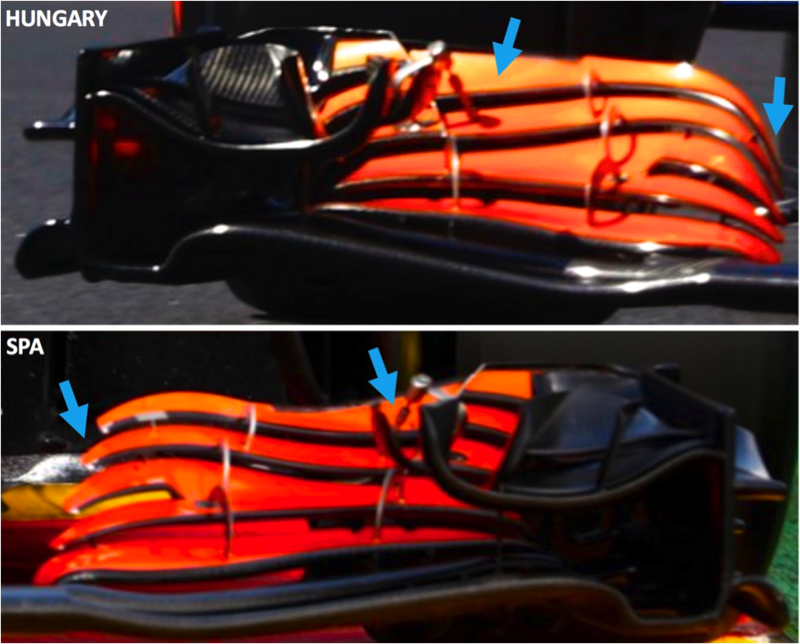 Overall, there was a lower overall AoA, to the extent that only three endplate louvres were required to minimise the pressure difference either side of the endplate for lower vortex drag. The V-shaped flap can be classified as a dihedral set-up, which improves roll (side-to-side) stability. 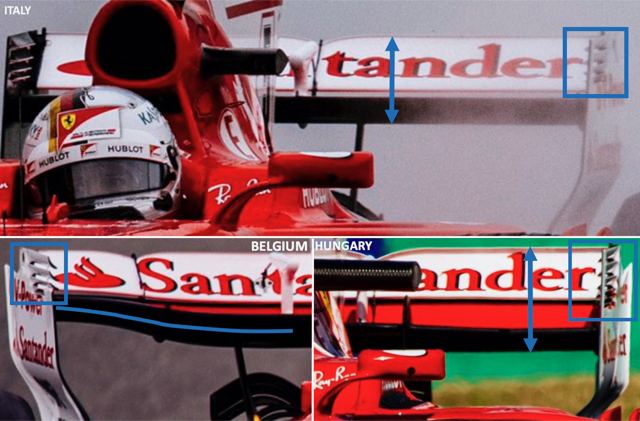 The downforce produced along the flap is perpendicular to its centreline, which is at an angle. Therefore, the downforce is orientated in a downward, outward direction, meaning that when the car moves in the roll rotation direction to one side, there is a tendency for the car to stabilise using the downforce vectors. Improving roll stability allows the car to maintain its optimum aerodynamic platform more often, improving its consistency and benefiting the driver’s confidence. This design is not often used on higher downforce wings because outright downforce is sacrificed, with the angle of attack being significantly reduced along the central portion of the wing. Also on this v2 Monza design, a much reduced chord was used near the endplates compared to the standard rear wing from Belgium (see curve above). 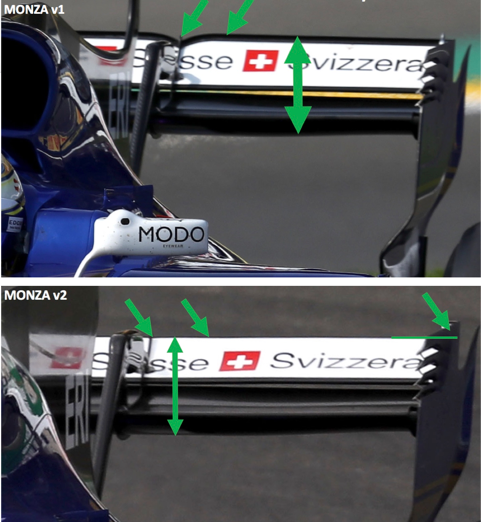 A great deal of technical focus this season has concerned many teams’ use of a spoon-shaped rear wing design in terms of the angle of attack, but the same can be said for the chord of Williams’ Monza v2 wing. Lowering the chord reduces the length over which the pressure differential across the wing’s surfaces can contribute to the drag-inducing wingtip vortices, again for improved straightline speed. 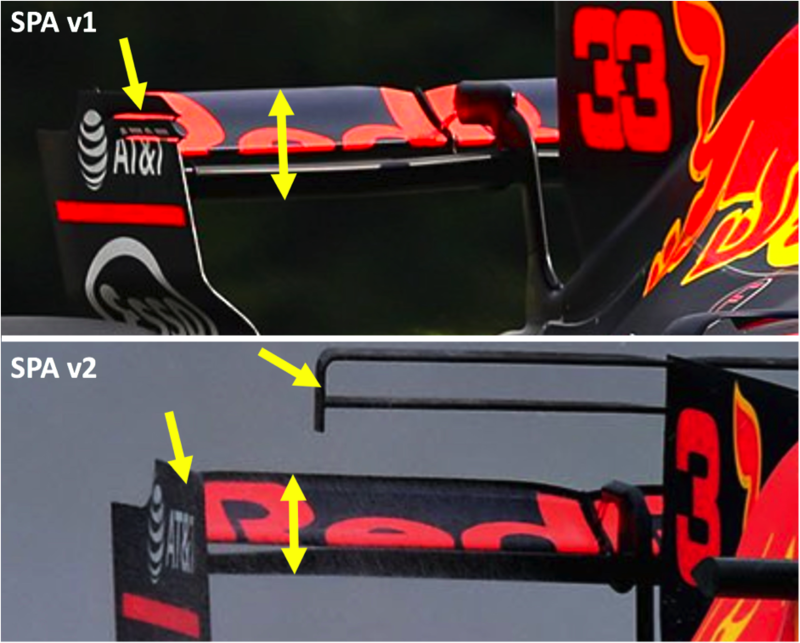 Red Bull knew that these two tracks would not be favourable to the RB13, so put extra effort into finding the optimum downforce level, bringing two different rear wing designs to Spa. The team opted for the higher downforce version for competitive sessions at Spa, and the v2 design for Monza. The Monza version rear wing was seriously considered for the Belgium race in a gamble to make up for a lack of straightline speed, but too much performance was given up in sector two for this to be a worthwhile solution, despite the T-Wing being added to this configuration. Note that the Italy edition features no endplate louvres such is the reduction in the pressure differential either side of the endplate by reducing the AoA significantly. Furthermore, the portion of wing nearest to the endplate features two further drag reducing concepts – firstly, the camber is lower, visible from the height of the black part at the leading edge of the wing, and secondly, the flap chord is reduced just inboard of the endplate (not shown here). Both of these updates would have reduced the pressure differential either side of the wing near the endplate, where the contribution to the wing tip vortices strength is greatest, lowering resistance even further. Renault enjoyed another strong weekend at Spa, proving itself to be the fourth fastest team for the third consecutive race, but found things more challenging at Monza, where the R.S.17’s very able chassis was unable to make up for time lost on the straights. As well as optimising wing levels for both races, the R.S.17’s bargeboards were revised at their leading edge with the top half being noticeably set back. This upper part of the bargeboard is aimed at producing a vortex, at the point where it steps down a little further back, that most likely travels around the sidepod’s surface, keeping airflow attached to it in spite of its curvature. 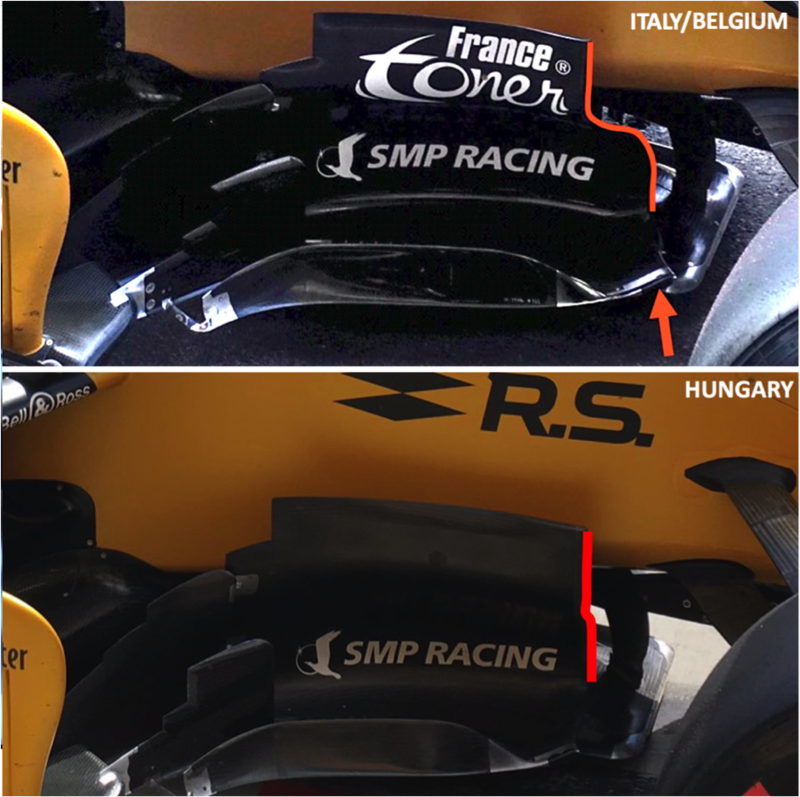 What Renault has done is effectively reduce the chord length of the wing-shaped upper section of the bargeboard, which reduces the strength of the bargeboard’s top vortex, lowering drag as a vortex is a high-energy airflow. However, this potentially harms flow over the sidepod, as airflow is now more likely to separate from its surface, potentially resulting in pressure drag increasing sharply. In this way, the Enstone team is trading off two different drag reduction methods. Additionally, the leading edge of the bargeboard footplate has been extended further forward and with its wing-shaped cross-section, it will result in the formation of a stronger vortex as high pressure air from above the part spills over to its underside. This vortex is directed downwards, and will seal the underside of the bargeboard and floor from turbulent air leaving the front tyre for improved downforce consistency from the rear half of the car. At the rear of the car, as I exclusively revealed on Thursday, a new rear wing was used and was the second smallest on the grid, behind Red Bull. Its philosophy is unchanged from the wing used in Baku and briefly run during Spa practice, with the efficient spoon-shaped profile. This design features a low angle of attack near the endplates, reducing the pressure differential either side of the wing surfaces here, where the contribution to tip vortex strength is greater. Meanwhile, a reasonable level of downforce is still maintained from the aggressive central section of the wing. The Monza-spec wing simply featured a lower angle of attack wing across the board, with a shorter chord flap to complement this. 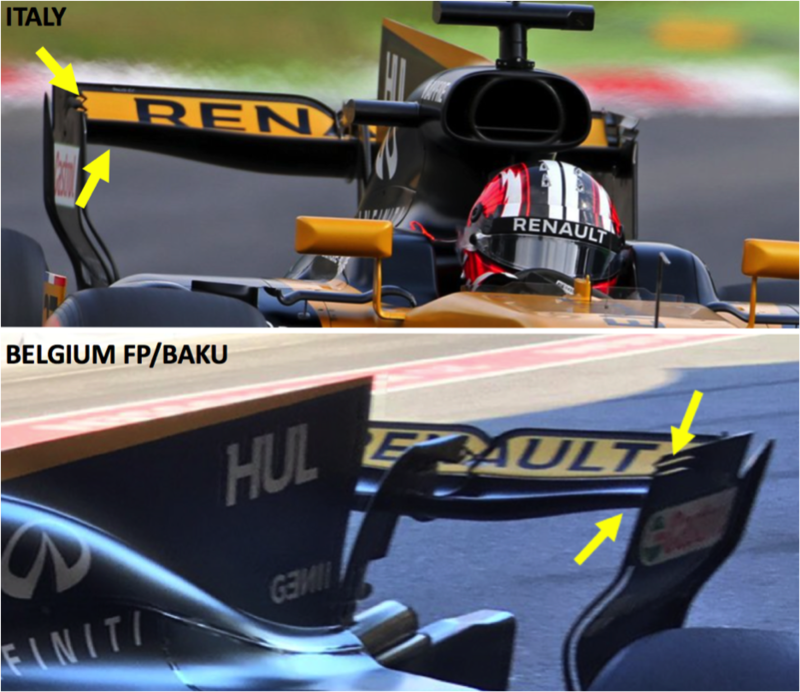 With Renault having been weak both at Baku and Monza, one might suggest that performance at low downforce tracks would be a priority for the team in terms of the 2018 chassis’ development. However, given that the majority of tracks favour a medium-high downforce set-up, and the team has been strong here, it appears that its development focus has in fact been in the correct direction. Once again, the Honda power unit held back McLaren’s very able chassis on circuits demanding good straight-line speed. This was despite McLaren quite significantly reducing the drag from its front and rear wings. Firstly, the front wing featured the cut down wing tips first introduced in Baku, which reduce skin friction drag and reposition the vortices they shed with respect to parts further back to minimise resistance. Further inboard, a different upper flap design was used, featuring a reduced chord, reducing skin friction further as well as weakening the wing tip vortices. For Monza, a very similar front wing design was used. At the rear of the MCL32, a brand new rear wing was introduced, featuring a slight spoon-shape and a significantly reduced angle of attack. Reducing the AoA near the endplates lowers the pressure differential either side of the wing in these areas. The resultant reduction in drag stems from the same methodology outlined above with Renault. Furthering this effect was the reduction in mainplane chord near the endplates, not visible here. Interestingly, the team decided to continue running with both its T-Wing and monkey seat at Spa, devices which are generally considered by other teams to be quite inefficient and therefore, they are run always run at high speed circuits. This would be especially true for the under-powered MCL32 chassis. It can be concluded therefore that, in some ways, McLaren continues to run its car in the configuration that it would use given a competitive power unit, allowing greater relevant information to be gathered on chassis performance for future development. 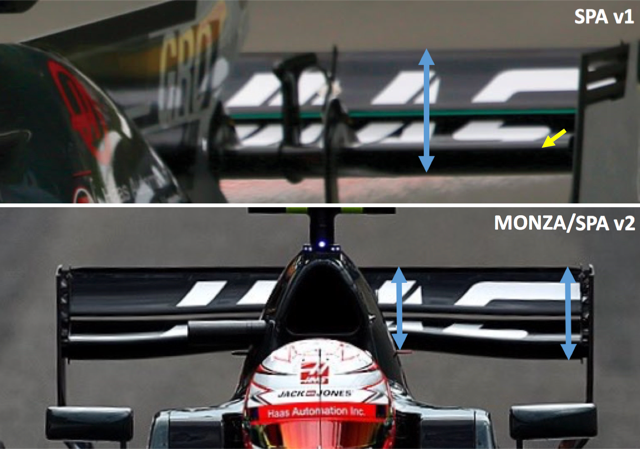 At the back of the VF-17, two different rear wing designs were assessed in Belgium practice, before Haas opted for the medium downforce version at Spa, and the low downforce edition for Monza. The v2 design features a significant reduction in angle of attack in the middle two thirds of the wing, while even the outer potions are less aggressive. Overall, there is less downforce and drag for improved straightline speed, but the method by which Haas has achieved this differs considerably to other teams. Using a spoon-shaped design would be more efficient, reducing the AoA and pressure differential near the endplates, given that these portions of the wing contribute most to the drag-inducing wing tip vortices. However, usually this design requires the endplates to be redesigned, and considering Haas operates on a smaller budget than most other teams, this is not a cost effective solution to the problem. As has been the case at all races except Barcelona, Sauber has been unable to score points on merit – a trend which continued at Spa and Monza. Their problems are twofold – firstly, a year-old Ferrari power unit, which is probably behind the 2017 Renault unit and secondly, poor Aerodynamics which have also made working the tyres an issue. Despite the team’s Aero package being overhauled twice this season, noticeable gains have not been evident relative to its rivals, suggesting the Swiss team may need to rethink its Aero philosophy for the coming years. For Spa, a new front wing was introduced, which completely eliminated the top flap, a very low drag configuration. However, this edition was ultimately discarded in favour of the version raced in Baku, with a cut down upper flap relative to the maximum downforce version from Hungary. Note that both versions tried at Spa featured reduced width flaps at their inboard section, in addition to narrower cascade winglets. The latter is puzzling considering that the purpose of the cascade is to direct air up and around the front tyre, reducing not only tyre turbulence, but also drag – something that would have helped the C36 combat its straightline speed deficiency. In addition, the most drag inducing part of the cascade set-up, the vortex (high-energy airflow) inducing vertical fin was retained. Further back, at Spa, Ericsson tested the team’s new shark fin which was first trialled in the post-Hungary GP test before the summer shutdown. As with the front wing above, this development was not used in competitive sessions at Spa. One of the benefits of the new wing is when the car is under yaw – for example during an oversteer moment, when the back end steps out. As this happens, the shark fin exerts a force on air particles which, by Newton’s Third Law, exert an equal and opposite force on the fin, directing the car back in line. However, when this happens, one half of the T-Wing (the half closer to the corner apex) receives much reduced airflow, so cannot create downforce. 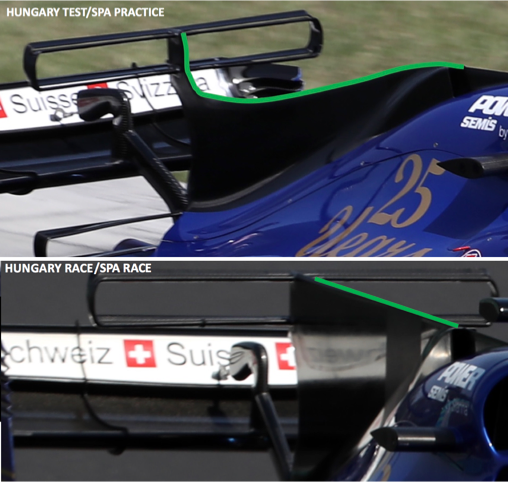 With the new shark fin, Sauber has traded off the benefits of the shark fin in correcting a balance issue against the T-Wing’s downforce reducing the extent of the sliding by increasing rear downforce. There may be further gains from the new fin given that it was also tested without a T-Wing by Ericsson at Spa. 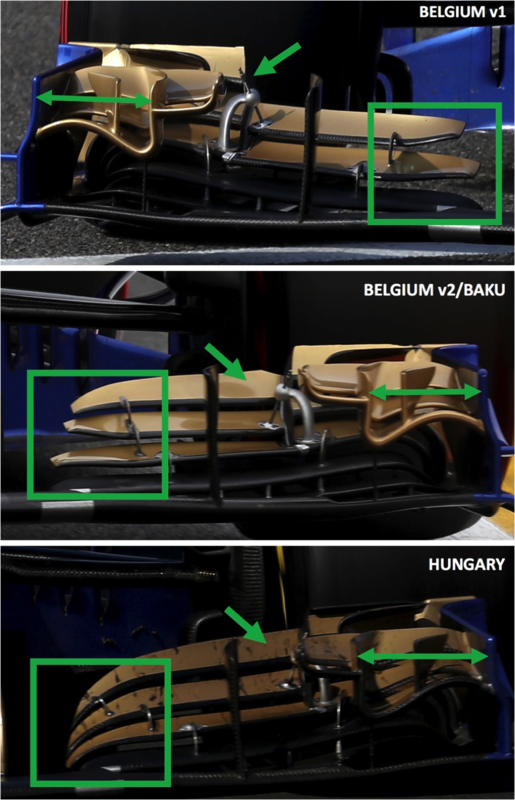 Finally, the lower of the two angle of attack rear wings tested in Belgium and Baku was finally used in competitive sessions at Monza. Of this, two variations were tried to find the optimum balance between straightline speed and cornering performance, the difference concerning the flap. The v2 design features a cut-down, reduced chord upper flap with no gurney tab. The gurney is designed to increase the high pressure region on the upper surface of the flap, raising the pressure differential across the wing for more downforce, but at the expense of stronger, drag-inducing wingtip vortices. It provides a cost-effective measure by which teams can increase or reduce the downforce of a wing without having to redesign its main components. Reducing the chord of the upper flap and removing its gurney were both aimed at minimising the strength of the wingtip vortices for better top speed. Ultimately however, the v1 design was chosen, perhaps with the opportunity of a wet qualifying session in mind.